It’s true that traditional metal braces and other forms continue to provide beautiful results in teeth straightening. Yet, for teens and adults that are looking for a versatile alternative, the clear choice is found in Invisalign. When compared to conventional methods, Invisalign straightens teeth discretely using customized trays that are clear and removable. What’s more, treatment time is remarkably shorter. Kennesaw Mountain Dental Associates is proud to offer our patients personalized teeth straightening using Invisalign. You can benefit in the following ways. While your teeth are being repositioned, your appearance remains the same. This is because Invisalign is virtually undetectable. Given a unique digital impression of your teeth’s characteristics, Invisalign trays fit seamlessly over your teeth. Comprised of a Proprietary SmartTrack material that is flexible, smooth and comfortable, Invisalign trays allow patients to forego pesky metal brackets, wires and elastic bands associated with traditional braces. Teeth straightening with Invisalign remains safer than other methods for two reasons. First, individuals needn’t worry about infection due to poking and jabbing from metal wires. Second, the level of pressure applied to teeth is less with Invisalign. As a result, there is a reduced risk of demineralization, decay and disease. Invisalign results are predictable. In fact, dental professionals can map out a patient’s treatment journey, and provide them with a preview of their smile. In addition, as new aligner trays are provided every two weeks, patients can visibly track their progress. Perhaps you’re wondering if Invisalign is right for you. 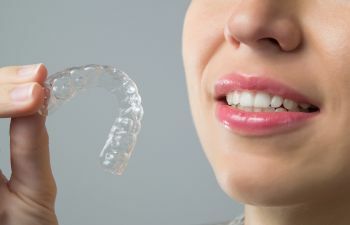 While only an experienced provider can tell you for sure, Invisalign aligners provide significant teeth straightening for teeth with mild to moderate misalignments. Generally, this includes teeth that are crowded, those with an overbite, underbite or crossbite, as well as gapped teeth and those with an open bite. Call Today To Schedule Your Smile Assessment! As your Invisalign provider, Kennesaw Mountain Dental Associates welcomes you to schedule a smile assessment today!